This months Improv Cooking Challenge is upon us again!! This month our two products to use are Lemon and Sour Cream. A lot of different recipes went thru my head. I thought about dips, certainly appropriate for all the football parties going on everywhere. I considered some type of bread, but I just wasn't sure. I finally decided on a Lemon Pound Cake that I have baked several times in the past. It's a simple cake, and if you are a lemon lover, it's perfect! Mix your baking soda into the flour. Cream your butter on medium speed. Add your sugar, and beat, still on medium for 4-5 minutes. 1 at a time, beating after each one. Now, we are going to add flour and sour cream alternately. add some to your butter mix. I usually scoop 2 spoonfuls each time. Let the mixer mix in the flour mix. Add a spoonful of sour cream. Alternate with each until it has all be added. might want to when you are adding the sour cream. You don't want to be hit by flying batter! the last thing in should be the last of the flour. Add your lemon extract and vanilla extract. Add your grated lemon rind. Now we are going to make meringue. a large bowl until you are done making the meringue. In your bowl, add your egg whites. 1 tablespoon at a time, until the peaks are stiff. Gently fold the meringue into the batter. Cake can be served warm or room temperature. made with Lemon and Sour Cream!! Walgreens, Express Scripts, and How it Effects You! If you are a Walgreens Pharmacy patient, and your prescriptions are covered by Express Scripts, you should be aware of a few changes in your coverage. If you are unsure if this applies to you, check the back of your prescription insurance card. If it has the Express Scripts name written on it, you may be affected, and you should talk to your local Walgreens pharmacist to make sure. What's happening? The contract between Walgreens and Express Scripts expired on December 31, 2011. Read Walgreens and Express Script to find out what's going on and how Walgreens is fighting for you. What does that mean to you, the customer? It means that you will have to make some changes when it comes to filling your prescriptions. Walgreens doesn't want you to have to change your pharmacist, or have to drive to a pharmacy that is not just around the corner, like Walgreens. In an effort to minimize the disruption this has caused their customers, Walgreens is offering a special discount on the annual membership for their Prescription Savings Club! For $10 a year everyone in your immediate family is covered, including a spouse, dependents 22 and younger and pets!! There is an individual membership price of $5.00. By joining this Prescription Savings Club, you will receive discount prices on your prescriptions. There are many other discounts, bonuses and savings available to members, so read more about the Walgreens Prescription Savings Club, and join! Secret Santa Surprise! and My First Giveaway! put together by Tandy from Lavender and Lime. and I want to share my surprise from my Secret Santa. It's a book called The Flavor Thesaurus! It is an absolutely wonderful gift! 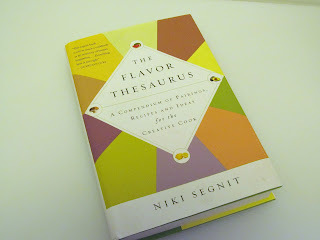 The book is "a compendium of pairings, recipes and ideas for the creative cook." It discusses 99 different flavors and different pairings that go well with each flavor. For instance, the book names Nutmeg as a flavor, and then gives you 21 foods that are compatible with nutmeg. They range from the traditional, such as apples to the unusual, or not so commonly known fact that nutmeg can be paired with cabbage. Who would have thought? Ok, probably a lot of people, but not me! The book also explains why the two go well together. In the pairing of nutmeg and cabbage, the book tells you that the "nutmeg can have an enlivening effect on dreary greens. Dot cooked cabbage with butter and speckle them, like bare winter trees decked in fairy lights, with freshly grated nutmeg". Is that great writing, or what? I love to create my own recipes, and sometimes I like to TRY to meander a little outside my comfort zone. This book is a big help in that area. I have already created 2 new recipes based on the info from the book, so I know that it will get a lifetime of use. Who was my secret santa? It was Bexx fromThe Divas Dishes!! If you haven't stopped by her blog, please find the time to do so. It's a wonderful blog with stories of her crazy life, her career, her love of food, her recipes, and lots of humor! I know you will enjoy it!! Thank you Bexx for a book that I not only love, but am truly using. Because I loved getting this book for the holidays, I have decided to have my first ever giveaway!!! Yah!! I own a copy of this appetizer cookbook, and I love it! I am an appetizer lover, and this book has over 450 great appetizer recipes. Also included is a 1 year subscription to Better Homes and Gardens! Leave me a comment, telling me what your favorite appetizer is. Last day to enter is Sunday, January 22! Winners will be notified by email. I will contact you via the email address you enter with. You will have 48 hours to reply. Sorry, US residents only. You must be 18 or over. My husband loves soup. I, on the other hand, can take it or leave it. For me, it is usually too warm here to enjoy it. But, we have lived in cold climates in the past, and we both grew up in a cold climate, so maybe that's why when it's winter, or even just a little chilly outside, my husband feels the need to sip on some soup. This soup is his soup of choice. It is simple and quick to make, so I always try to have the ingredients at home, ready to go. Open the two cans of Broth into a large pot. Set your heat on medium. Peel your onion and cut the onion in half. Turn your onion sideways and slice again. Add the onion to your pot. I had a few that had over stayed their welcome in the fridge. "What are you doing with the mushrooms?" and add it to the soup. Add in your handfuls of noodles. Let the soup cook on high for about 5-6 minutes. Add pepper to the top of the soup. Today we are celebrating the birthday of Elvis Presley. The KING would be 77 today! Can you believe it?! I have read that Elvis loved Peanut Butter and Banana Sandwiches. So I thought that a version of that sandwich would be a way to honor the exceptional singer, musician, and person that the world still does, and will always love. also, but there is no reason to put it in the pan too. Every little bit helps!! Right? with biscoff. I used a generous amount! Smush the banana in a bowl. on the piece of bread in the pan. The taste is unbelievably delicious! I'm sure Elvis would approve. Today for the Crazy Cooking Challenge we were asked to find a Chicken Noodle Soup recipe posted on the web from a fellow blogger. After we find the recipe, we are to make the recipe ourselves, and then post about it. This is so much fun! I spent a lot of time looking for the perfect recipe, and I think I found it. My recipe is from Fields of Cake and Other Good Stuff. It is beautifully written by Carrie Lynn, and it has some really great recipes, and some wonderful photography to go with it. Stop by and browse her blog. It has a great tutorial on how to cover a round cake with fondant (something I need help with), a snickers cake I want to make for a friend who is a snickers fanatic, and several drink recipes that look scrumptious! I think that there is no greater comfort food than chicken noodle soup, and even the name of this soup agrees with me!! In small bowl, combine the garlic powder, onion powder, poultry seasoning, salt and pepper. Mix in the chicken chunks. In a large soup pot (please no non-stick on this, you want the good caramelization bits from cooking to enhance the flavor of your broth however it will still be tasty in a nonstick) heat the oil over medium heat and add the chicken. Cook until juices run clear. Remove from pan and set aside. Add the veggies and rosemary. Saute until fragrant. Add the wine to the pan of veggies and scrape up all of those tasty bits from the bottom of the pan. You may notice the wine get very dark. That is OK, it is delicious! Once the bottom of your pan feels free of the bits, add the remaining chicken broth to the pot, along with the bouillon. Raise heat to medium high. Bring to a boil. Happy New Years to everyone!! Today's recipe is the perfect light meal to start the new year off right. I wish I had started this years blogging off right also, but here is what happened.~I put this chicken salad recipe together. As I was just about done, I realized I had no cheese. I mean, you don't need cheese, but I think it adds a lot to the recipe. So I went to the store and picked up the cheese. Of course, you know I couldn't buy just cheese! Oh no, I had to spend 30 minutes, just browsing, picking up this and that, basically accomplishing nothing. I get home, and I make the sandwich, take the pictures, and begin to eat my creation. What's wrong?~Where is the avocado? I have to have the avocado on this sandwich. It's healthy. It's good for me. It has to be a part of this sandwich. Also, I love avocados, and I try to eat one everyday. I have to have the avocado.!!! So I make another sandwich. No problem, they are little, after all. And most of the pictures are of the ingredients being put together, so this can still work!! I take the pictures of the avocado on the sandwich. They look really nice. I'm using a new camera I got from my husband for Christmas. I love this camera. It works great, and takes better pictures than my last camera! So, now I am downloading the pictures onto my computer from the card. Everything is good. I start to write this post. I go to put the pictures on my post~There are no pictures! What!! What is happening? I find out that I have erased every picture having to do with this recipe!! I can't believe it! I just sit here dumbfounded for a few minutes. Then I figure, I better at least make another sandwich so I can photograph it! The good news? I downloaded Christmas pictures onto my computer at the same time, and I didn't lose any of those!! So, all was not lost! So, I am sorry for the lack of pictures for this post. I will try to make up for it next time! This chicken salad recipe is one I came up with as an alternative to using mayo. I love everything in this recipe, and it is really good anytime of year. I hope you like it also! and a slice of cheese, cut in half.